How does one know whether his or her portfolio has been performing well compared to those of other investment managers? Alton Cogert, president and chief executive officer of Strategic Asset Alliance, recently posted a blog on the Strategic Asset Alliance website discussing the use of statistics to gauge the past risk adjusted performance of a portfolio versus its future performance. Mr. Cogert (pictured at right) has granted Captive.com permission to share with our readers the thoughts he expressed in his blog post, as follows. Do You Know Your Manager's Risk Adjusted Performance? You are already familiar with comparing the total return of your portfolio to a relevant benchmark. And, you may also be comparing that performance to those of other managers with a similar investment strategy. But, there are other ways to figuratively X-ray investment manager performance. How about comparing the risk adjusted performance of your manager and the risk adjusted performance of the relevant benchmark? You can apply the same calculation to the Benchmark Returns and get a different Sharpe Ratio, which you can compare to the Portfolio’s Sharpe Ratio. In most instances, the higher Sharpe Ratio of the two would indicate whether the investment manager or the benchmark performed better on a risk-adjusted basis (where risk is the volatility of returns). However, we should remember a rather important part of total returns – manager fees. Since every portfolio manager will tell you that past performance is no guarantee of future performance, it might be worthwhile to consider the only guaranteed part of performance – the negative return automatically caused by manager fees. But, how can you easily obtain these statistics? You could ask your investment manager. You could ask your investment consultant to independently calculate these results. Or, you could obtain the updated statistics for not only your investment manager, but its competitors, from Manager Select. Let’s focus on the 10 Year column and review the manager’s long term performance. Before fees, this manager has beaten its benchmark by 16 basis points (bps), or 5.06% versus 4.90%. This was achieved with lower standard deviation (volatility) than the benchmark, or 3.24% versus 3.28%. The result was a slightly higher than benchmark risk adjusted return statistic (Sharpe Ratio) of 1.23 versus 1.16. But what about after fees? Since managers typically use a sliding scale to determine fees (lower bps for large portfolios), you can use your company’s actual fees paid to the manager. Or, if this is a manager you are not using, you can input your portfolio size into Manager Select and it will calculate the estimated manager fees, based upon the manager’s stated fee schedule (subject to negotiation, of course). 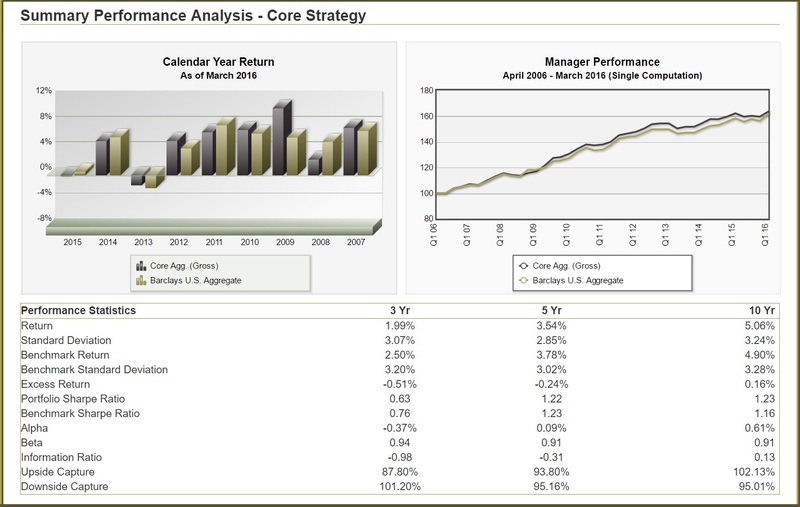 Let’s say you are not using this manager and your portfolio size indicates a fee of 15 bps for this core fixed income manager. How to calculate the after tax Sharpe Ratio? So, the Sharpe Ratio, before fees, is 1.23, after fees it is 1.19. And, in the latter case, it is only marginally better than the benchmark Sharpe Ratio of 1.16. Or, one might say, risk adjusted after tax performance is just a ‘rounding error’ different from the benchmark Sharpe Ratio. This is just one important way of comparing risk adjusted performance, after fees, to the relevant benchmark. There are, of course, other ways of comparing performance using measures like the Information Ratio, Upside/Downside Capture, Drawdown Analysis, etc. And, let’s not forget that quantitative comparisons are only one piece of the puzzle when comparing and analyzing investment managers. There are many qualitative factors that are comprehensively included in Manager Select. Knowing your manager’s performance is great when compared to a benchmark. Understanding Risk Adjusted Performance can be a first step.